If fiction has taught us anything, it’s that Vikings have all the fun. Pillaging gold. Killing enemy soldiers by the dozen. Getting drunk before, during or after said events. They’re living the reaver’s dream. So, of course, they make a fine fit for video games with their love of violence, alcohol and cooked meat – and Swords & Soldiers has all three in cartoonish abundance. Whether you’re stockpiling money or simply chasing barbarians into the sea, this former WiiWare gem still has a mischievous look in its eye as it makes a surprise appearance on the Nintendo Switch eShop. There’s a good chance you’ve played it before as well. First launched in 2009, it’s appeared on a ton of platforms, including the Wii U and 3DS, as well as the aforementioned Wii. It’s one of those games that’s following the Minecraft or Doom ethos of appearing on every possible device with a screen attached. 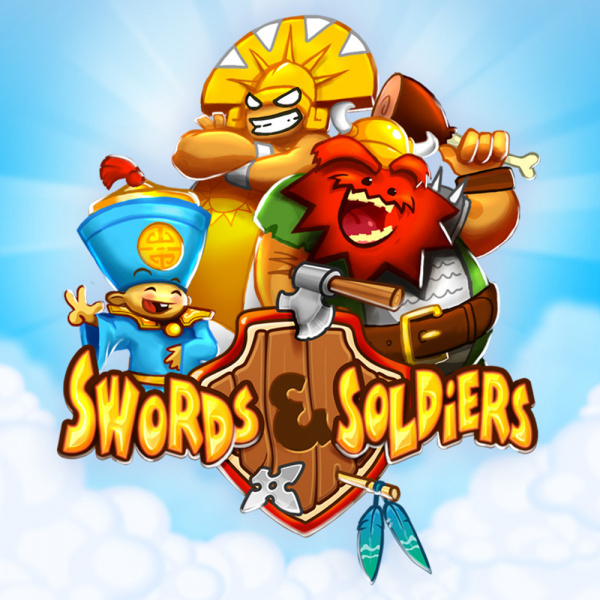 Ubiquitous in presence as it may be, Swords & Soldiers is still a charming strategy game that takes a mobile gaming approach to the genre by adding in the need to juggle resource management and activate magical powers. Set on a 2D plane, your chosen horde begins on the left side of the map and will need to plunder and smash their way to a goal on the right. Sound simple enough? Well, there are plenty of obstacles to overcome on your way, which all differ depending on the mission at hand. 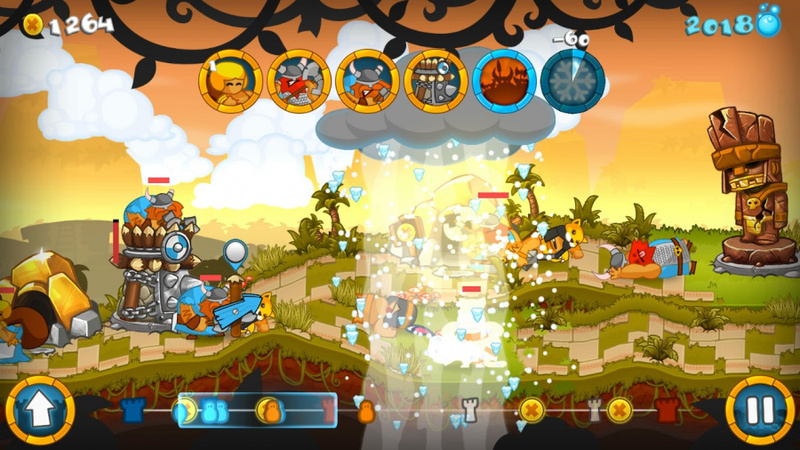 You start off with a finite amount of gold and mana (your source of magic, naturally), so you’ll need to head into the upgrade menu to spend your cash to unlock everything from character types (ranging from axe-throwing brutes to gold miners with ample assets) to lightning strikes and healing rays. You’ll need to do this for each new mission, so choosing the right upgrade is key in each instance. Soldiers, miners and other members of your clan act automatically, so soldiers will always head towards the nearest fight as soon as they emerge from your base. Taking certain parts of the side-scrolling map might enable you to take a mine and keep your gold (and, thus, your tactical choices) far broader, while other times you’ll need to collect chests of gold in order to boost your bank balance with one-off top-ups. Paths will often diverge when you reach areas with these chests, often requiring you to choose between a safer (yet less lucrative route) or a more dangerous one filled with loot. The single-player campaign comes with four different stories following slapstick adventures of the Vikings, the Aztecs, the Chinese and the extra Chief Meat questline. Each one flits between different challenges and objectives, which forces you to think differently about your upgrades and how you spend your money/mana. 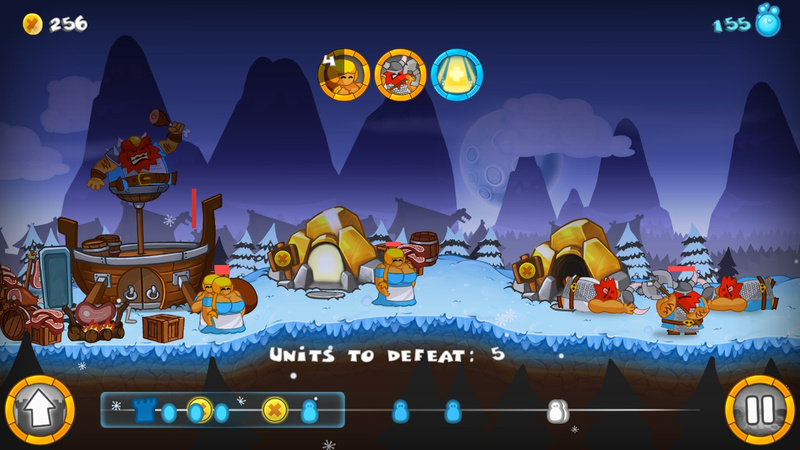 When defending your own base, you’ll need to research and buy lots of axe throwers to man your towers, use a storm of permafrost to freeze groups of attacking foes and employ slow-but-powerful frosthammer troops. As short as battles are (usually no more than seven or eight minutes), they can easily go sideways if you’re not careful. The real fun comes in learning when to commit to mining for gold over producing troops, and when to send your soldiers barreling into the fight. Do you spend your slowly-refilling mana on a burst of rage that increases a unit’s speed and damage output? Or do you hoard your money and upgrade your mana regen rate? It’s those decisions that can win or lose a battle, and Swords & Soldiers’ relentless pace means it never takes long to restart and make the right choice next time. As a port, Swords & Soldiers is pretty decent. Visually, there’s an odd amount of blurriness that really stands out when there’s text on screen, but it doesn’t affect the flow of gameplay and you’re very unlikely to notice in the heat of battle. You can use both the Joy-Con and the touchscreen, and you can seamlessly switch between the two at will. There’s also support for local multiplayer, including sharing the touchscreen for some splitscreen tower defence/siege on the go. Sure, it looks and plays very much like a mobile game, but with no in-game purchases to worry about, you can enjoy everything it has to offer in all its silly glory on Nintendo Switch. As surprise release games go, Swords & Soldiers’ age – and the sheer number of platforms it’s appeared on – might lead you to sleep on it. But despite having appeared on plenty of Nintendo consoles already, Two Tribes’ comical mix of resource management and real-time strategy is just as fun, silly and rewarding as it was back in 2009. Its looks are a little blurry in places, but the simplicity of its concept (and the short nature of its matches) make it a perfect fit for handheld play. tldr summary: looks great; plays great; buy it. 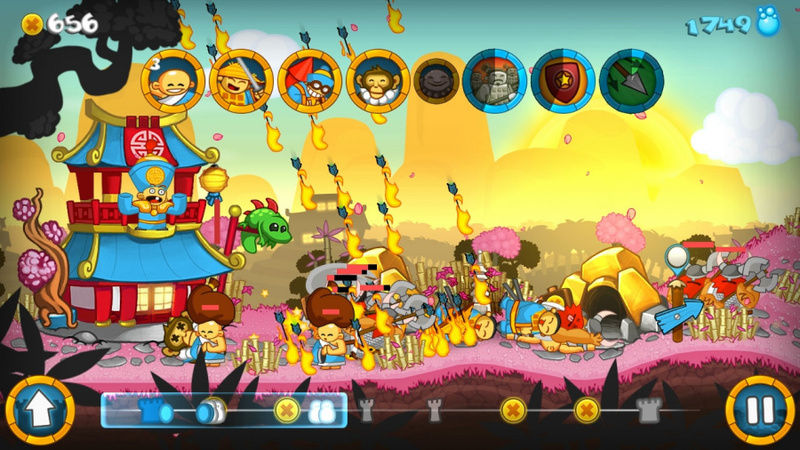 Is this game like that flash game, Age of War? I used to love playing that game back in middle school. I’m in! Will be a first time playing for me. Already got the second one so don't need this one. One is enough for me. All I know about this game is the Warioware DIY game the developers made to promote it, where the guy eats meat. If you at all interested, buy this. It’s awesone and well worth the $5 or so right now, I think it was 50% off but don’t hold me to it. I already own this on Wii/u/3ds so I am skipping it this time, but will be getting the sequel day 1 if we lucky enough to get it. Never finished 2nd on Wii U.
I already decided to grab it as it's too cheap right now to say no. It's in the backlog for now so don't know if/when I'll actually play it. A WiiWare classic, one that I've just redownloaded before the Wii Shop's closure at the end of the month. The game's depth, a Dom referred to, is in the timing of producing the varied units (which move automatically at different speeds) in the hope that they reach the front in some semblance of a formation. Very satisfying when it works! I bought the WiiWare and Wii U version and completed both. I kinda want to have it on the go as well. 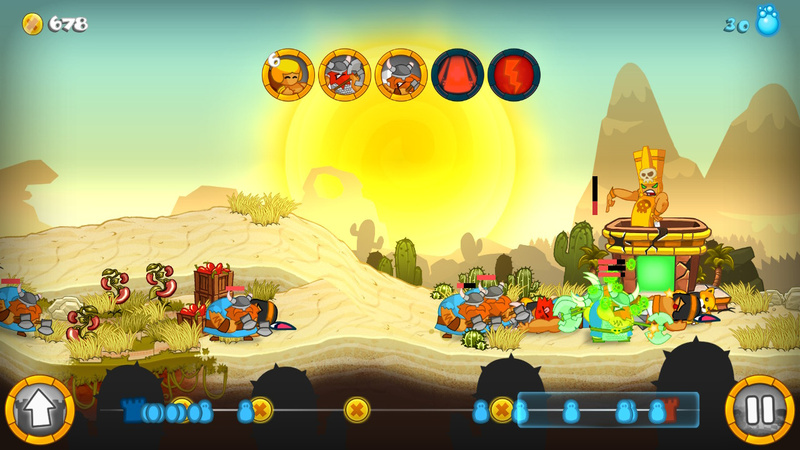 It's a very fun defense / strategy game. I also bought Swords & Soldiers II for Wii U. I heard it comes to Switch as well. Good times! Like it a lot. It needs online play though, so much more fun can be had with that added. I don't suppose this version has it...? One of my favorite Wiiware games—alongside Lit and Mega Man 9–but I’ve played it so many times that I can’t justify buying it again. 8/10? That‘s a surprising rating! @BanjoPickles Sequel out on Switch on March 1st. Meh... I'd rather play Swords & Serpents. Good review, until the end when it abruptly fell off a cliff before going into the various control schemes. This played best on Wii, sort of OK on mobile, horribly on PS3 until they added in Move support to mimic the Wii version. Not sure how the Joy-Con will work on here, probably no pointing motion which is a shame, but the 2 player touchscreen might work even though ti looks too small. For anyone interested in double-dipping, I'm almost certain this is the first time the DLC - Sausage Fest - is available on any Nintendo console. I could be wrong, it may have been on Wii U, but I'm pretty sure it wasn't. Also wasnt' on PS3. I own it on both of those and am planning on buying it yet again, it's just too much fun not too, and I've always wanted to play the DLC. FYI - the sale price of $4.xxUS is until Feb 14th then it goes up to $7.49. The DLC is $1.99 on Steam, the game is $9.99. So we can actually buy something on Switch cheaper than Steam for a change. @Anguspuss "how much for a ancient wii game seriously"
Less than half the price of the game on Steam. @retro_player_22 I thought the first game was so much better than the second game. A lot more variety, fun, and slow building up, and continuous story. I felt like the 2nd was all about graphics and how many new characters they could come up with. Never felt like a game to me, just jamming in as much cool looking stuff as they could. But to be fair my son liked the 2nd game better. If true, that’d be awesome! On a side note, I would insult sword fight a rubber chicken for ports of the Monkey Island Games! I know it’ll never happen, but I can dream. There are some great Wiiware titles that have never left the Wii, I'd like to see those get ported now that the Wii shop has closed. This game seems neat. I might check it out on sale at some point. @Heavyarms55 I think it’s especially sad the ReBirth games are confined to the Wii. @wiggleronacid I have played it, and yes it is like Age Of War! Great Game! @IceEarthGuard Awesome, thanks responding! Might pick it up soon! That man's beard has eaten his face.